This nightly group rental consists of 3 separate units: Deckside Suite, Orange Blossom Suite, and Porchside Paradise. Three separate bedrooms with king-sized beds, two queen sleeper sofas, and two private hot tubs! Located literally steps from Duval St, you can take advantage of the vivid nightlife, fine dining, two nearby company pools (merely 2 blocks away), and plenty of shopping! Conch Republic Cottages are absolutely perfect for larger gatherings of friends and/or family. All together, this group property sleeps a total of ten. The property itself is very secure and private with a front gate and lush vegetation surrounding the premises. Efficiency at its finest! 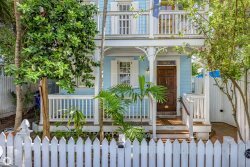 The Deckside Suite is the perfect vacation rental in Key West for those who are trying to get the most bang for their buck. You have everything you need in this cozy, studio-style unit, including a kitchenette, cable TV, free WiFi, and a shared back porch, hot tub, and BBQ grill. This property is a short distance to all the fun nightlife on Duval Street, but is still very private. Welcome to sweet paradise! Located pn Petronia Street, the Orange Blossom Suite is in close proximity to all the fun-filled action of Duval St; however, it is private enough to not hear any of it! Orange Blossom Suite shares a huge back patio with one other suite (Deckside Suite; managed by us), and includes a relaxing hot tub and BBQ grill. Walk to fine dining or cook your own meals in your fully-equipped kitchen that includes a stove, oven, dishwasher, microwave, blender, and toaster! The loft bedroom has an ultra-comfy king-sized bed, but there is a also a full-sized sleeper sofa in the living area. Porchside Paradise is located in the front section of the Conch Republic Cottages. This beautiful home-away-from-home features an inviting and spacious front porch—great for people watching—as well as a private two-person hot tub. The unit is gated off from the other cottages, which makes it very private and great for pets too! The inside is beautifully decorated and features an updated kitchen complete with an ice-maker, refrigerator, coffee-maker, stove, oven, blender, and microwave. The upstairs loft has a king-sized bed and a skylight. The downstairs living area is equipped with a queen-sized sofa bed and sleeps two guests, if necessary. The maximum people allowed in this property is 10. If there are more than 10 people are in your party upon arrival, your party will be asked to leave without compensation. Sleeping Arrangements: 3 king beds, 1 queen sleeper sofa, and 1 full sleeper sofa. Pets: Pets welcome; some restrictions may apply. The maximum people allowed in this property is 10. If there are more than 10 people are in your party upon arrival, your party will be asked to leave without compensation. Violation of ANY house rules will result in your party being asked to leave without compensation.